Wonderful pictures of a kyudo celebration at the Hachiman Jinja in Toyokawa, Japan. | The Kyudo Project Blog! Wonderful pictures of a kyudo celebration at the Hachiman Jinja in Toyokawa, Japan. This is a photo at the ritual kin-teki (gold target) competition held at 14 September, Hachiman-shrine in Toyokawa. 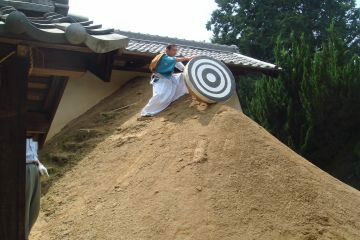 A 3-shaku (90 cm) target is put at the highest point of aduchi (target bank) to finish up the kin-teki session. You can find photos at the more ceremonial competition in spring here.